Mark Zuckerberg, the founder of Facebook was here. His name certainly rings loud and crisp-clear in the vast firmament of our knowledge- economy that drives several global thoughts and processes. He, along with his friends, Dustin Moskovitz, Chris Hughes and Eduardo Saverin, by sheer creative ingenuity came up with the site, which allows users to create their profiles, upload photos and communicate with other users. That was in 2004. By the end of that year, it had reached 1million users. But it has since grown to more than 250 million users, over the past 12 years, making Zuckerberg a billionaire in the process. That global attention that riveted on the commercial nerve-centre of Nigeria; nay the West African Sub-region with his recent visit was understandable. It clearly signals a profound message of increasing hope for faster economic development of the megalopolis and that of the youths. There comes in the commendable giant steps taken so far by the governor of the host state, who is repositioning the state for an all-embracing Centre of socio-economic and political ideals. Since his assumption of office, his vision of Lagos as a destination of choice for any serious-minded, entrepreneur from anywhere in the world is not in doubt. What with the assurance of all-round, tight security network, courtesy of his donation of top-of-the range security gadgets to the police, as well as, promoting all-inclusive community surveillance across the state. This is supported by the massive infrastructural development of roads, bridges and clearing of waterways to facilitate safe journeys on water. What about the focus on the triple projects of Eko Atlantic City, the $300 Elegushi Kingdom Imperial City, as well as, the history-making Smart City, coming up in conjunction with Smart City LLC, Dubai, the first of its kind in Africa. Indeed, it is heart-warming to note that the Co-Creation Hub, Yaba; the first of the two facilities visited by Zucerberg, was donated by the state government. Its noble aim was to further the cause of an enhanced ICT-driven entrepreneurial activities that the state is currently known for. In fact, the visitor was so thrilled that he had this to say: “I got to talk to kids at a summer coaching camp and entrepreneurs who came to Cchub to build and launch their apps. 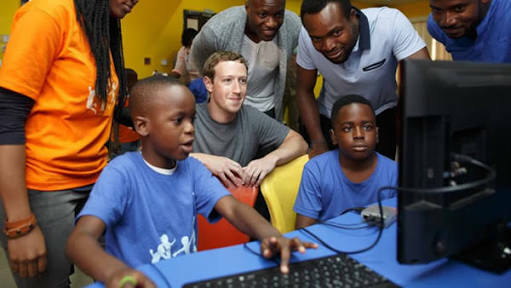 I’m looking forward to meeting more people in Nigeria.” Truth is, that Zuckerberg had read a lot about it before his visit but needed to find out, first-hand, what the true situation was.